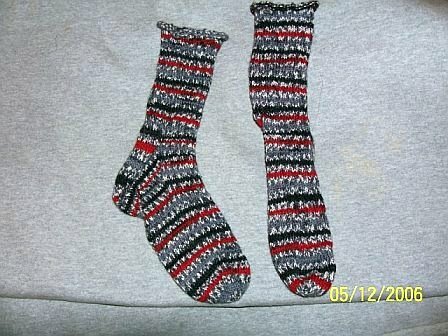 This is my first pair of socks that I made. They are made of wool and I was afraid they would be really itchy and not comfortable but they actually feel pretty good. It's just amazing to me that yarn can do patterns on their own - it makes you look like you're a professional knitter. I was always afraid the socks would be too hard but Stephanie had me do them with her and now, I think I'm up to 5 pairs now. Love doing them! I don't think people understand all the work in a knitted pair of socks. That is ALOT of stitches!